For nearly a decade, in the south central highlands of Ecuador, just south of the country’s third largest city of Cuenca, campesino and Indigenous communities that depend on farming and dairy production have been fighting against the gold and silver projects of Canadian mining companies, such as IAMGOLD. They continue to voice concerns about the destructive impacts mining could have on their water supplies. Criminalization of local community members and leaders has occurred at each stage of their struggle. Local dairy farmers participated in a series of scientific studies, protests and meetings with state and company respresentatives out of concern that IAMGOLD’s exploration activities were already contaminating their water supplies. After finding our that their local parish president was collaborating with the company, they shut down public operations of the parish government office, briefly holding the parish president captive. ▷ The rural parish president pressed charges against 18 community members for kidnapping. 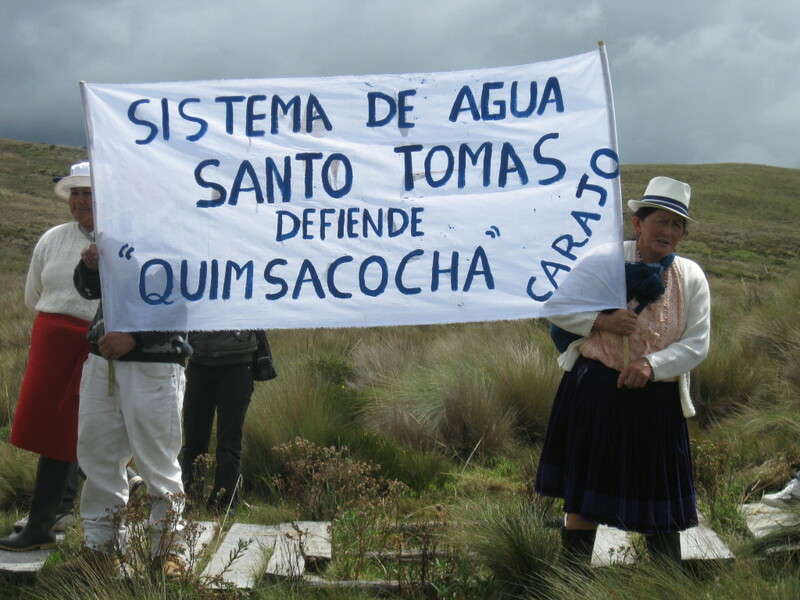 ▷ Over the next three years, IAMGOLD undertook a public relations campaign that found support from the Cuenca press that painted local farming operations as the principal source of water contamination and their demonstrations as violent. Land defenders participated in demonstrations, including marches and road blockades in order to have their demands heard. State mediation led some groups to temporarily stop protesting and to undertake a study to demonstrate that IAMGOLD’s mining concessions had been granted illegally, without prior consultation or due process according to mining regulations. A small group took to the streets in June. ▷ Police outnumbered protesters and used heavy tear gas. ▷ Dozens were reportedly wounded and over thirty-three were detained and charged. 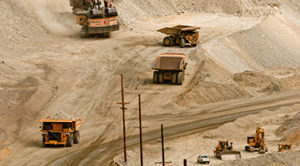 The Mining Mandate was decreed and IAMGOLD’s Quimsacocha project was suspended. 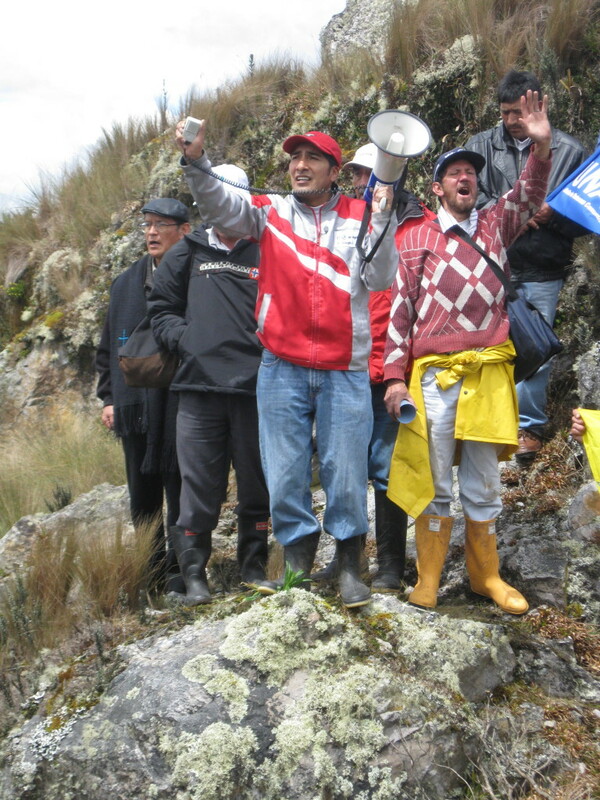 ▷ While a new mining law was rushed through, communities in Azuay province, like others across the country opposed to large-scale mining, were subject to the President’s frequent insults during his weekly national radio addresses that painted them as turncoats and traitors and were picked up in the press. The Quimsacocha project resumed. The Mining Mandate was not otherwise applied to revoke the company’s concessions, even though they continue to overlap with important water supplies and protected forests, and were not previously consulted with local communities. ▷ As the mining law was rammed through and a new water law presented to the legislature, 24 Indigenous and community leaders faced charges of sabotage and terrorism around the country for their alleged role in protests. 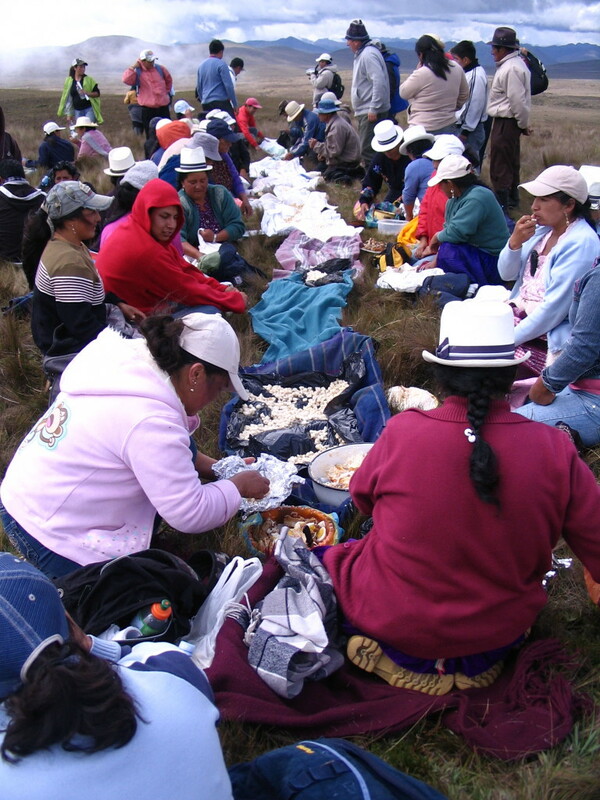 The newly elected rural parish president of Victoria del Portete and the then president of UNAGUA were among them, both leaders in the struggle against IAMGOLD’s gold project. 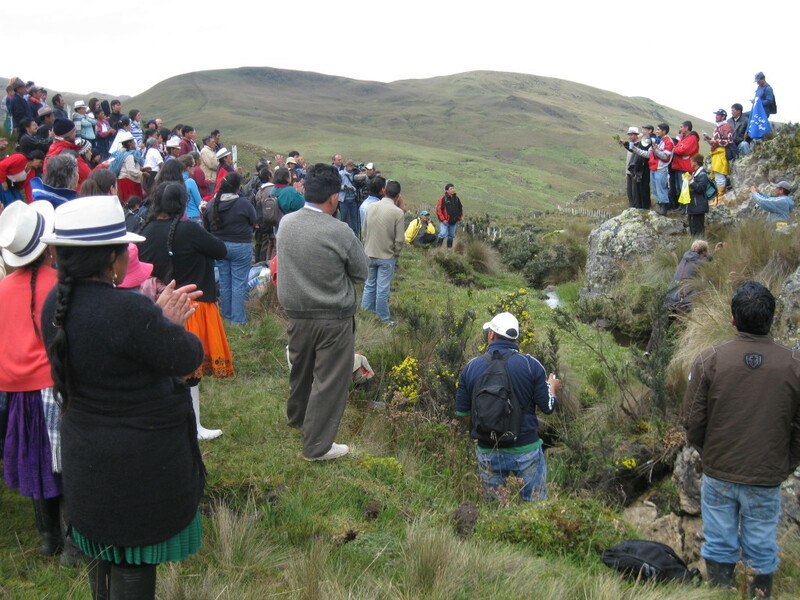 Communities in Azuay turned out in large numbers to protest the government’s proposed water law that failed to protect water supplies from large-scale mining or to ensure campesino and indigenous organizations a decisive role in water management. ▷ The President accused the marches of being funded by foreign foundations in an effort to stigmatize protesters. ▷ Three local community leaders were arrested from the area of Victoria del Portete and Tarqui, accused of sabotage and given a preventative prison sentence. The three community leaders served three days in prison before they were declared innocent by a provincial level court. ▷ The attorney general’s office appealed the aquittal and in 2011, a judge declared the three guilty and sentenced them to a year in jail. The final decision was appealed. The newly-renamed Loma Larga mining project. In an effort to offset its own risk, IAMGOLD sold the project to INV Metals, in which it became a majority stakeholder, such that IAMGOLD retains an interest in the project, now called Loma Larga. INV Metals has been assessing how to advance the project under a new definition for “medium-scale” mining activities, even though local communities have been very clear that they are not interested in any mining of any scale in order to protect their water supplies. A new round of protest and criminalization is anticipated. Sign-up to our low-traffic mailing list to get updates about ongoing campaigns, and stay informed about Canada's resource wars. 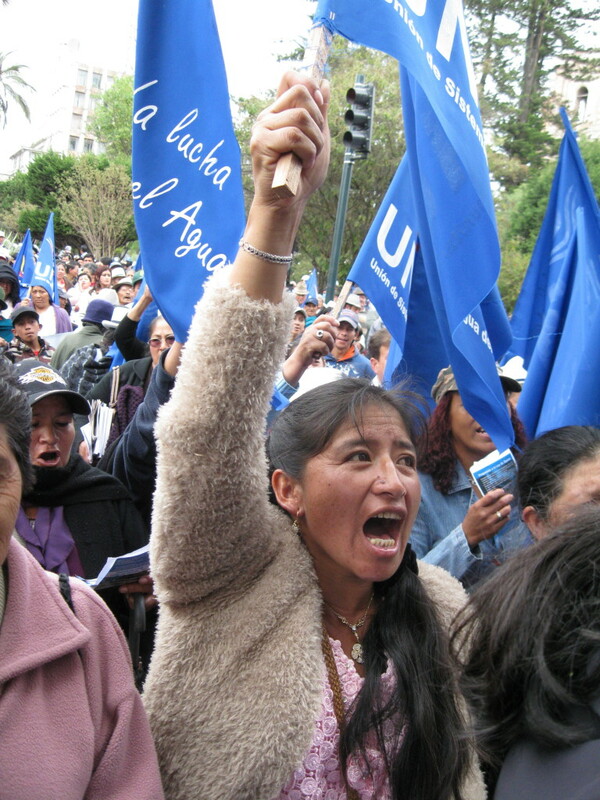 Respond to direct calls for support from mining-affected communities and their allies.